Glovius v3.3 for Windows is now available! We are pleased to announce the release of Glovius version 3.3 for Windows. Measure text is more readable and visible than before. 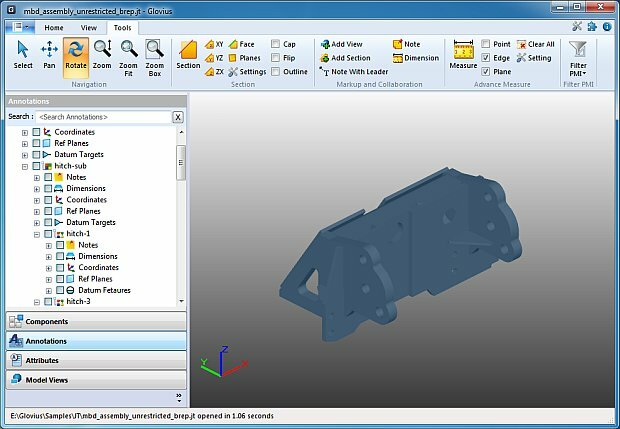 Measure non-BREP formats like STL, OBJ, 3DS etc. Save dimensions as markups, with the Markup & Collaboration add-on. A much improved notes tool in Markup & Collaboration add-on. Insert/edit models from all supported formats and save as JT. The new add-on manager displays subscription, HOSTID, and general version information.